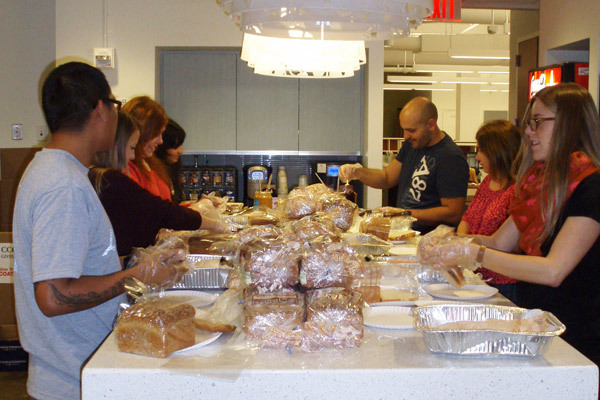 Chandler Chicco Companies New York partnered with the Bowery Mission Homeless Shelter to provide food to the homeless. Chandler Chicco Companies New York partnered with the Bowery Mission Homeless Shelter to provide food to the homeless. In lieu of providing employees lunch, CCC employees worked together to make over 600 sandwiches to donate to those in need. Chandler Chicco Companies DC participated in the Thanksgiving Basket Drive to support the National Center for Children and Families (NCCF). The office created four baskets, which provided Thanksgiving dinners for four families. The NCCF helps homeless families, victims of domestic violence, and vulnerable adolescents. CCC NY is collecting new and unwrapped toys for the Marine-sponsored Toys for Tots Foundation through December 16. The Toys for Tots program collects toys to provide to needy and underprivileged children to ensure they have a Happy Holiday. Last year, employee donations benefited 50 local children, and this year CCC hopes to bring cheer to many more. CCC NY is also hosting a NY Cares Coat Drive through December 31. NY Cares is hoping to donate more than 200,000 coats to those in need this year. They anticipate sending at least 50,000 of those coats to aid those specifically in need from Hurricane Sandy.